Last night, five more online blackjack players advanced to Lucky18Casino’s BKJK BOWL Monthly Final. On December 30th they’ll compete for $2121 and a seat at the Championship Table where the grand prize is $21,000. 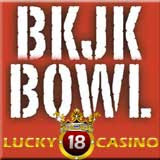 Since it began in September, BKJK BOWL has awarded nearly $20,000 in cash prizes and more than $33,000 is yet to be won. Every Sunday night since September, Lucky18Casino has awarded $1121 and six free seats to the monthly main event. Players can even earn one of twelve free seats at the Sunday blackjack tournament in one of three qualifiers each week (entry fees as low as $11). Players can also buy-in on Sunday night for $55. A total of twenty-five free seats will be given away to the $21,000 Final Showdown in January. Lucky18Casino.com offers state-of-the-art games and millions in jackpots from Realtime Gaming (RTG), the only one of the major online casino software providers still open to US players. Lucky18Casino’s $1800 Deposit Bonus is the most generous anywhere and they provide toll-free telephone support 24-7 to players around the world including the U.S.
All tournaments begin at 10:00 pm EST. Tournament buy-ins and prize details and a complete schedule of Weekly and Monthly Bowls can be found at http://www.lucky18casino.com/.